The Sarbannes-Oxley Act (SOX) is a mandatory requirement for all listed corporations in the US, whether foreign or not. Compliance is not an option. Other countries are developing similar legislation so the books value is international in scope. SOX is a hot topic and the effects are just beginning to be felt world-wide. This new book goes beyond the implementation phase of SOX and looks at the reaction to the Act in terms of costs, benefits and business impacts. This book is for Senior Managers in the Business and Financial/Accounting Communities who want/need to know what the reaction of business and government is to the SOX legislation, what it is costing and how the effects are penetrating through the business environment. Mike Holt presents a comprehensive review of the impact that Sarbanes-Oxley legislation has had on business, the financial community, governments and the public since its inception in 2002. The Sarbanes-Oxley Act has been somewhat successful, but not completely and the cost (well over a trillion dollars) might be considered too high a price to pay for the gains. This book takes a hard look at the costs, benefits and other impacts as well as at what influential and prominent financial, government and business leaders think about it now. International in scope and content and including interviews with prominent business leaders, CEOs and CFOs of large and small corporations. Compliance with The Sarbanes-Oxley Act is now mandatory for every listed US corporation and overseas corporations listed on US stock markets. Covers the reaction of business and government to this legislation, what it is costing and how the effects are penetrating through the business environment. Senior Management in the Business and Financial/Accounting Communities, including CFOs (Chief Financial Officers); CIO (Chief Information Officers); Senior Management (Management Accountants) and Boards of small to medium sized corporations (and emerging companies anticipating an IPO or acquisition/merger in the future) both in North America and the UK/Europe. Chapter 1. 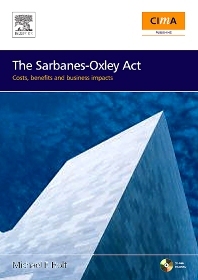 Background The history and overview of the Sarbanes-Oxley Act of 2002 and the events that precipitated it. Enron, WorldCom. A description of the expensive bits, the Internal Control System. Chapter 2. The impact on large corporations. The expense, disruption of operations, affects on clients, suppliers. Trends for corporations to buy back their stock and go private to avoid SOX. Why? What about the benefits? Improved operations, communications, efficiency. Chapter 3. The impact on small corporations. The ability to afford extensive IC systems, disruptions, increased rigidity demanded by the ICS and its effect on creativity, innovation, worker attitudes and job satisfaction. Chapter 4. The impact on the financial community. The effect SOX has had on brokers, stock markets and the financial community in general. Chapter 5. The impact on accountants and auditors. The extra burdens, responsibility, integrity. Liability of auditors. The huge increase in business for them. Can they justify the rapidly increasing costs of audits? Risks and benefits to corporate accountants, CFOs. Is the CFO now the most important person in the company? Is he paid enough? Chapter 6. The impact on governments. The world wide effects of SOX. How are other governments responding? Can they afford not to? Does the SEC challenge the sovereignty of other countries by its interpretations and sanctions? Chapter 7. The impact on the public. How does SOX affect the average person on the street? How about shareholders? Who’s going to pay for all this? Chapter 8. Soxpacked. “Soxpacked” v. to be heavily impacted by the SOX act of 2002. (derived from the sports term for being whacked heavily, usually in the face, by a ball hit or thrown by an opponent). The charges and cases resulting from SOX already, such as the “Scrushy” $2.7 Billion fraud trial (he got off), but others that are in the works. Are we going to see high profile actions? How about small companies who are trying to comply? Chapter 9. Conclusions. Is SOX going to stick? Will it be changed? Will it solve the problems? What could have been done differently? What if Enron and WorldCom had not been “busted”, would they have recovered, would their shareholders be better off? Is the cure worse than the disease? How is a CEO of a large corporation supposed to “know” the financial and process situation in his company and all its subsidiaries in enough detail to be able to sign off the annual reports with confidence – most of them know little of the esoteric financial systems used by their companies. They rely on their CFO and senior financial managers to keep them informed of trends and major items and leave the details to the accounting department? Michael F. Holt is a Senior Technical and Business Documentation specialist with over thirty years experience. Mike's specialty lies in his ability to take complex and specialized concepts, documents and proposals, and present them in a clear, attractive and easily understood manner.